Julia Spring, Chief Flight Nurse, is receiving the Star of Life award for her continued selfless leadership of the AMR Air Clinical Operations. 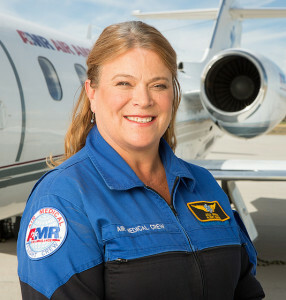 Julia has spent the last 30 years in the flight medicine world and has been with AMR Air since its inception in 2002. Her work this year to ensure that the organization achieved reaccreditation as a CAMTS operator was a testament to her dedication to the quality and safety of patient care and operations. Additionally, due in large part to Julia’s efforts, AMR was able to add neonatal transports to the level of service provided. Julia leads the clinical operations of AMR Air and AMR Air Hawaii, which are the highest practicing critical care level of prehospital medicine for AMR.